Manhattan Beach, California, 1983. A gorgeous, affluent seaside town – nobody suspected that half a dozen evil, satanic child molesters were hiding in plain sight. Among others, Ray Buckey and his mother Peggy McMartin-Buckey, were charged with hundreds of counts of child abuse, all stemming from horrifying allegations made by the parents and children of the community. 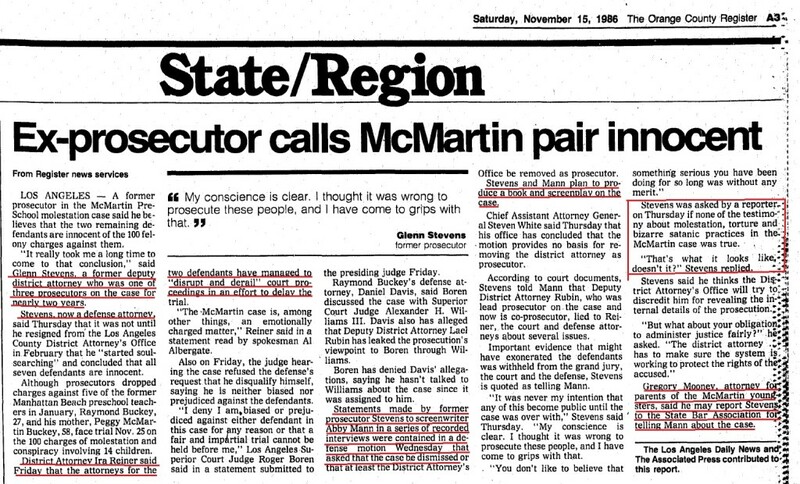 With the benefit of hindsight, we now know that the accusations began with a woman named Judy Johnson. None of this happens without her. Judy Johnson was going through a divorce in mid-late 1983. She called the McMartin School to arrange daycare for her two-year-old son Matthew, but had been told that they were full. She brought him in anyway, and apparently left him in the yard. After some discussion, the people at McMartin accepted the kid. 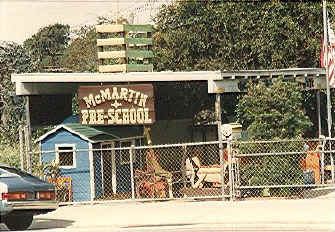 The McMartin School as it appeared in 1983. One day in August 83, Matthew told Judy that he was having painful bowel movements, she examined him and all seemed well. He went off to preschool. When she picks him up from McMartin, she takes another look and, finding redness and blotches, she’s immediately convinced that something awful has taken place at school that day. She asks Matthew, and he denies that anything strange has taken place. After a while, she coaxes him to admit that Ray Bucky had taken his temperature, and she sees this as confirmation of the abuse. So she takes him to the hospital, and eventually to the police. What happens next is what we’re talking about this week. From Kee Macfarlane to Geraldo, from secret tunnels to naked movie stars – we’ll cover everything. Interesting show, I remember the case. Do you know why more of the students did not recant their stories publicly later on? Googling I just came across one. It is so weird to think you can make someone think they were abused for real. It seems like a therapist could help them figure out now if it was real. If it’s the same effect on the child either way then aren’t the therapists guilty of abuse? Are the children as traumatized as abused kids? Didn’t the ‘well-meaning’ prosecutor say she’d never seen such frightened kids? That’s a really good question. Very few of them ever made it to the testifying stage, and since they were minors at the time, we’ll never be able to know who all of the children were, what they were led to believe, and what they may believe now. Kee Macfarlane is certainly not talking about it. I’d like to think most of them knew they were pretending/making up stories, so the damage is hopefully minimal for a majority. I’m sure a good percentage of the parents must have realized pretty quickly that these allegations were ridiculous, even if they were swept up in the momentum of the case. For a more in-depth discussion of that kind of thing, you should check out the movie Capturing The Friedmans, which depicts a different abuse hysteria case. The interview with a (disguised) adult “victim” is very enlightening. You should also check out the book “Satan’s Silence” by Debbie Nathan. Very, very in-depth about this stuff, and a fascinating look at how this stuff happens. You guys mentioned West Memphis 3, are you thinking of ever exploring that case? Damien Echols openly participates in podcasts, you may be able to draw his attention to the show. I’ve been thinking about it, yeah. I’ve gotta find a way in that isn’t just a retread of the Paradise Lost movies or West of Memphis.